How many calories in Crayfish? We provide you with the Crayfish calories for the different serving sizes, Crayfish nutrition facts and the health benefits of Crayfish to help you lose weight and eat a healthy diet. Crayfish are crustaceans and look like a small version of a Lobster. Crayfish provide a good source of vitamins A, B1-B3, B5, B6, B12, calcium, iron, phosphorus, potassium, magnesium, copper, manganese and selenium, as well as other vitamins and minerals. They are also full of protein. They are low in fat, and contain no carbohydrates or saturated fat. But, they are high in cholesterol, containing approximately 45% of the recommended daily intake for a 100g serving. Crayfish contain omega-3 fatty acids. They are therefore thought to help protect against heart disease and reduce the risk from Alzheimer’s. 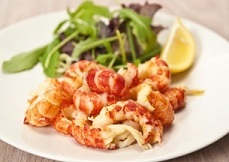 Other Crayfish benefits are believed to include added protection against some types of cancer. Compare calories in Crayfish with the other calories in seafood. Scientific Name: Astacus, Orconectes, and Procambarus spp.